The weather has warmed up so I have been playing on the front porch some. A few nights ago after water the plants I snapped a few pics with my phone. Waiting to see how long I can keep my new Texas Sage tree alive. 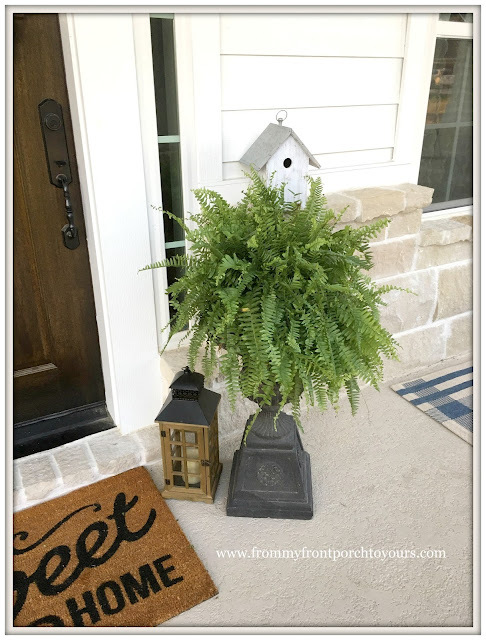 I picked up a few ferns. The ones I had last year grew to be huge but sadly they died on me literally the day after we moved from into our rental. It was the craziest thing. I am in the process of coming up with ideas for a patriotic theme. I figure a patriotic porch will be good for Memorial Day thru the 4th of July. One of my newest additions to the porch are the plaid rugs. They really cozy up the space! I love this shot I got of the porch! Hoping soon that Mr. Front Porch and I will get the tongue and groove up on the ceiling and painted. Then I have two ceiling fans that will be going up as well. 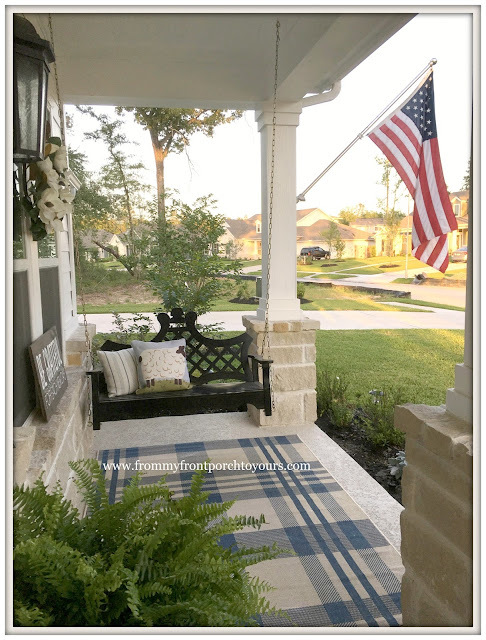 Our front porch is one of my most favorite spaces here at the new house. I have a new wreath that just came in and a cute red tricycle I purchased last week secondhand that I can not wait to add to the porch. Thinking of making a few patriotic buntings as well so stay tuned. Love that porch swing!! Where did you get it? Thank you Pam. It is from Grandin Road. Absolutely love and adoration! Please tell me where you got that amazing swing. Love the rug and chairs. The space is so inviting. Thank you Stacey! The swing I purchased from Grandin Road last year after we signed on to build. They still carry though. Thank you Brooke! It will not be long before you are settling into your new home. Can not wait to watch it all come together. I have enjoyed seeing your porch pictures on Instagram, Pamela. And it looks even better here. Can't wait to see the addition of the red tricycle. What a fun and welcoming space! Thank you Courtney! Are you guys counting down till summer yet? 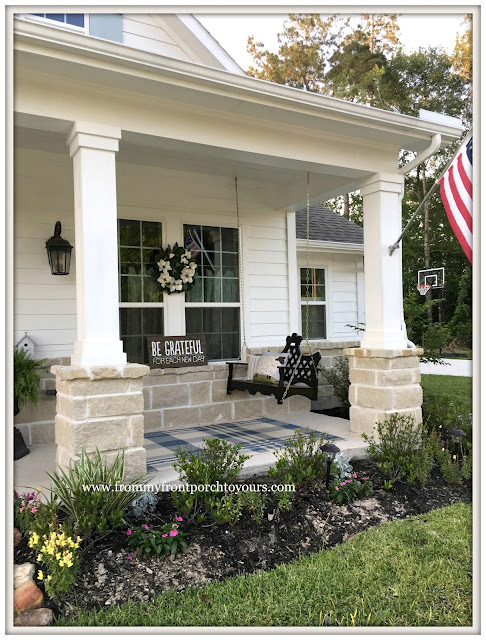 What a great porch you have, Pamela! Clean and fresh and perfect for relaxing. It has your signature touch as well. You seem to always have your own way of doing things and not following trends. 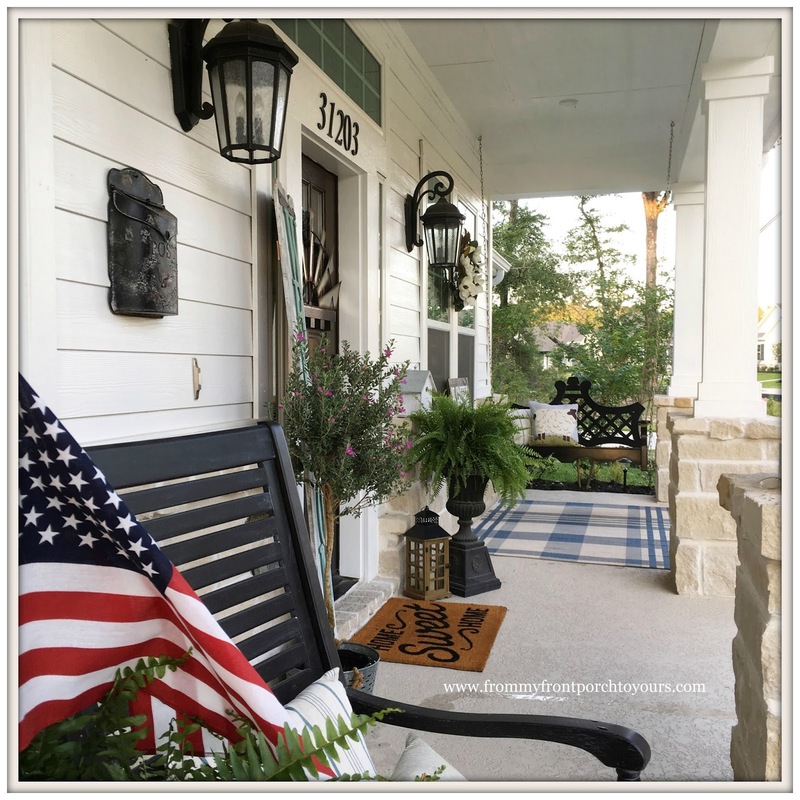 Enjoy decorating for Memorial Day and the 4th. I need to start thinking about that! Thank you Jane! You are always so kind. I hope that you have a great weekend my friend. Everything looks so awesome !! A very welcoming entry. Memorial day at your house will be the best :) have a great weekend. I love It!! The swing! Enjoy Darlin! I love what you did here. Your porch is soooo inviting. Love, love, love it!!! 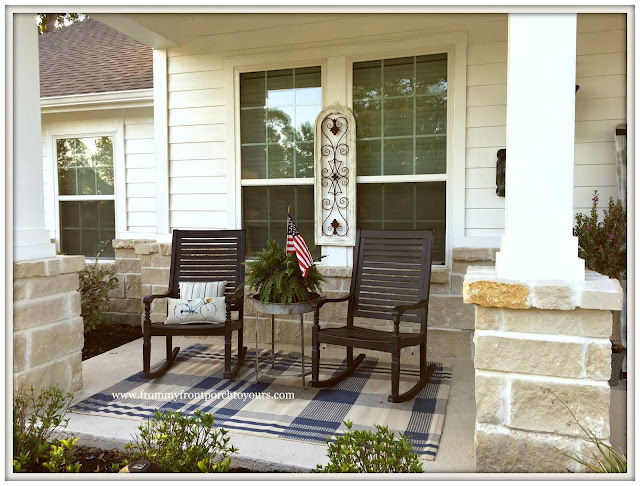 So very pretty Pamela..and yes, hope your Texas Sage thrives beautifully on your charming Texas porch...love that rug and the gorgeous swing! So pretty Pamela! Love the farmhouse touches and that cute swing. I know you will enjoy your space. Hello! 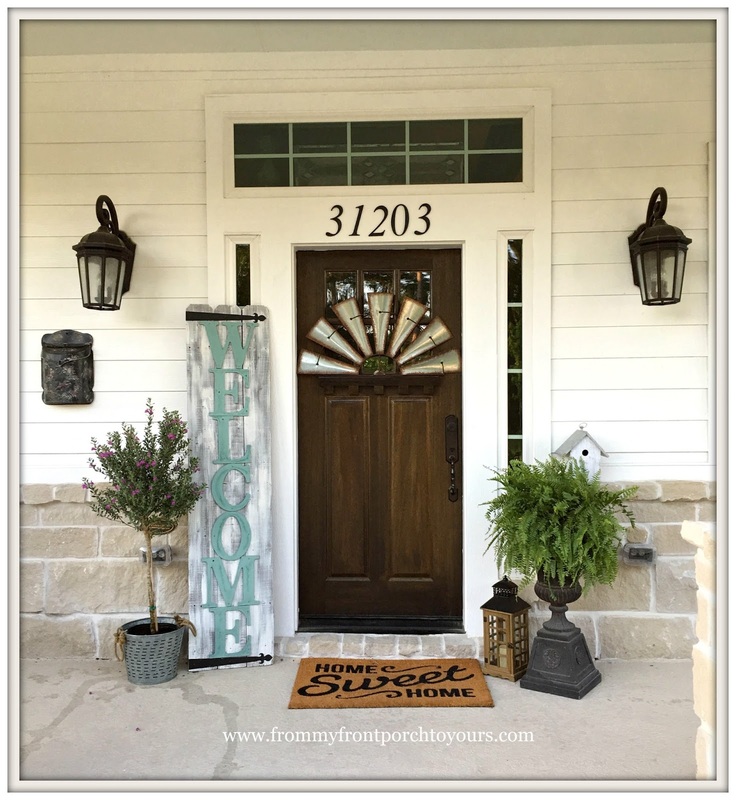 I was wondering if you could tell me where you purchased your WELCOME sign of your front porch? It absolutely perfect for what I have in mind! Hello! I was wondering if you could tell me where you purchased the WELCOME sign on your porch? It's just perfect for what I am looking for. 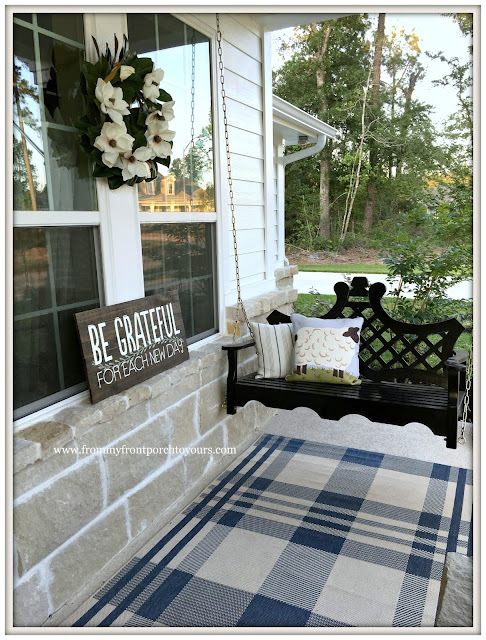 This porch is so lovely and inviting! Please tell me about the rug.